This image of Pluto from New Horizons’ Long Range Reconnaissance Imager (LORRI) was received on July 13, and has been combined with lower-resolution colour information from the Ralph instrument. Credits: NASA-JHUAPL-SWRI. 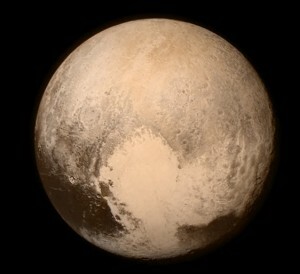 You can’t have failed to have seen the amazing images of Pluto taken by the New Horizon spacecraft over the last week. What you may not have thought about, is that these images are taken using remote sensing technology. Remote sensing, particularly when referred to as Earth observation, is thought of as a scientific field focussed on looking at our planet – we often use this in our own marketing! However, the simplest definition of remote sensing is being able to know what an object is without being in physical contact with it (inspired by Sabins 1978). Although the Earth is the most obvious example, European Space Agency’s Rosetta mission to comet 67P highlighted, remote sensing can go extra-terrestrial, or in this case interplanetary! Long Range Reconnaissance Imager (LORRI) that’s a panchromatic high magnification imager, which at its closest approach will have a pixel size of approximately 50 m.
Ralph is a visible and infrared imager and spectrometer that has three panchromatic and four colour imagers within its Multispectral Visible Imaging Camera, which takes images twice a day; it has a pixel size of around 250 m. In addition, Ralph has a Linear Ealon Imaging Spectral Array (LEISA) that’s an infrared spectrometer with 1.25 – 2.50 micron wavelengths, which will produce thermal maps of Pluto. Alice is an ultraviolet imaging spectrometer with 1 024 spectral channels at 32 spatial locations along its rectangular field of view. It analyses the composition and structure of Pluto’s atmosphere, by measuring either ultraviolet emissions or absorption of sunlight by the atmosphere. A basic version of Alice is also onboard Rosetta. The image at the top of the blog, which was first shown around the world last week, was taken in black and white by LORRI, but has been combined with lower resolution colour information from the Ralph instrument – a technique call image fusion. REX (Radio Science EXperiment): measures atmospheric temperature and pressure. SWAP (Solar Wind Around Pluto): studying Pluto’s interaction with solar winds. PEPSSI (Pluto Energetic Particle Spectrometer Science Investigation): a directional energetic particle spectrometer, measuring the density, composition, and nature of particles escaping Pluto’s atmosphere. SDC (Student Dust Counter): built and operated by students of the University of Colorado, it measures the concentration of space dust in the solar system. The pictures produced by the instruments on New Horizons are fantastic. However, with extra-terrestrial remote sensing the travel time involved is significant; New Horizons was launched on the 19 January 2006 and Rosetta on the 2 March 2004. This means the technology onboard is a decade old, although they were cutting edge instruments at launch and so the lag is probably not ten years, but it is behind what we can do now. For example, QuickBird-2 has a pixel size of 0.61 – 0.72 m. However, improved spatial resolution is not only dependent on the technology. The high speed flyby of Pluto meant sensors only had a short amount of time to take the images, and so the focus needed to be the whole planet, or specific areas, in high resolution detail. There is also the problem of bandwidth, and the difficulty in transferring large amounts of data back to Earth. Remote sensing is a fast moving field of science, technological advances and innovative ideas for data that mean exciting discoveries happen regularly. Last week’s UK Space Conference gave an insight into what’s happening next. Make sure you’re onboard! Pixalytics blog with contributions from Davydh Tretheway. This entry was posted in Data, ESA, NASA, Remote Sensing, Space Can Help, Space Industry, UK Space Industry and tagged Colour, Earth Observation, ESA, Fly By, NASA, New Horizons, optical images, panchromatic, Pluto, remote sensing, Rosetta, UK Space Conference by Andy. Bookmark the permalink.